ALLIANCE, Ohio -- No. 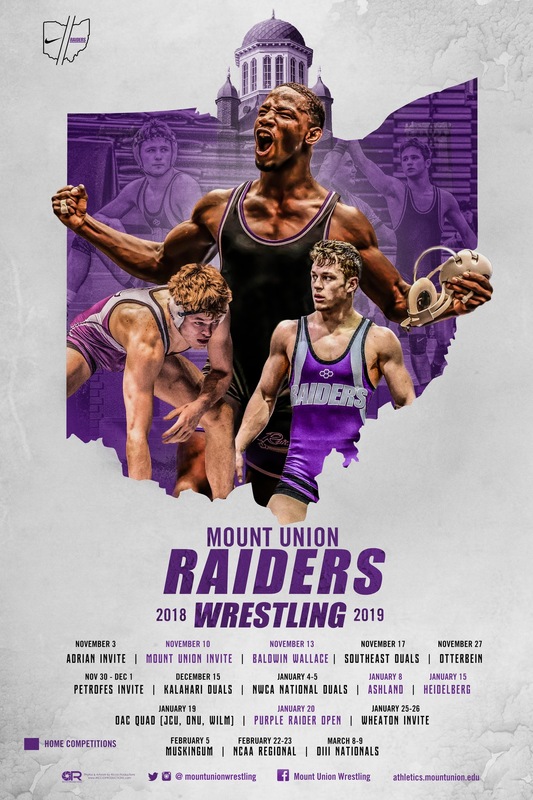 7 Mount Union wrestling team defeated Ohio Athletic Conference opponent Heidelberg 39-6 during Alumni and Senior Night Tuesday at the McPherson Academic and Athletic Conference. The Purple Raiders won eight out of ten matches, winning the first seven, as they improve to 14-3 overall. With the loss, Heidelberg falls to 8-5 on the year. Four of Mount Union's victories were by pin-fall in junior Seth Hayes (Ravenna/Rootstown) (125 lbs., 2:27), No. 10 ranked sophomore Antwon Pugh (Fairlawn/Copley) (157 lbs., 0:37), sophomore Michael McIntire (Wadworth/St. Vincent-St. Mary) (165 lbs., 1:29) and No. 2 ranked senior Jairod James (Bedford Heights) (174 lbs., 4:52). Also collecting bonus points for the Raiders was sophomore 149-pounder Luke Hernandez (Nashport/Tri-Valley) who came away with a 21-6 techincal fall in 5:25 and senior Nick Corvo (Medina/Highland), shutting out his opponent for a 10-0 major decision in the final match of the night at 285 pounds. No. 2 ranked sophomore Jordin James (Bedford Heights) and freshman David Massey (Cuyahoga Falls/Woodridge) supplied back-to-back thrillers; James winning by sudden victory, 10-8, at 133 pounds while Massey edged past with a 4-3 decision at 141 pounds. Mount Union next travels to University Heights, Ohio for an OAC quad-match against John Carroll, Ohio Northern and Wilmington starting at 10 a.m.